The sheep recovered by police. A number of stolen sheep were returned to their owner following a joint operation between police and other agencies in Crumlin on Wednesday, March 15. 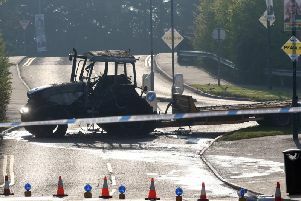 Detailing the incident, a police spokesperson said: “Antrim and Newtownabbey DST were involved in a joint operation with The Department of Agriculture Environmental and Rural Affairs and also the Food Standards Agency at premises in the Crumlin area yesterday (Wednesday).